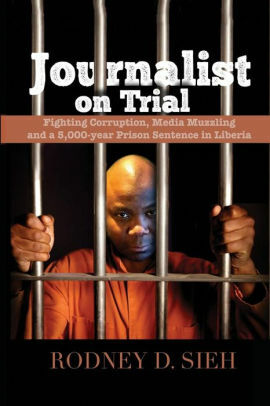 Monrovia – When Augustine Weah took a year off from his job at the United Nations in hopes of feeling the waters of the still-infant government headed by George Manneh Weah, he had no idea it would lead to his arrest and subsequent short stint in jail. 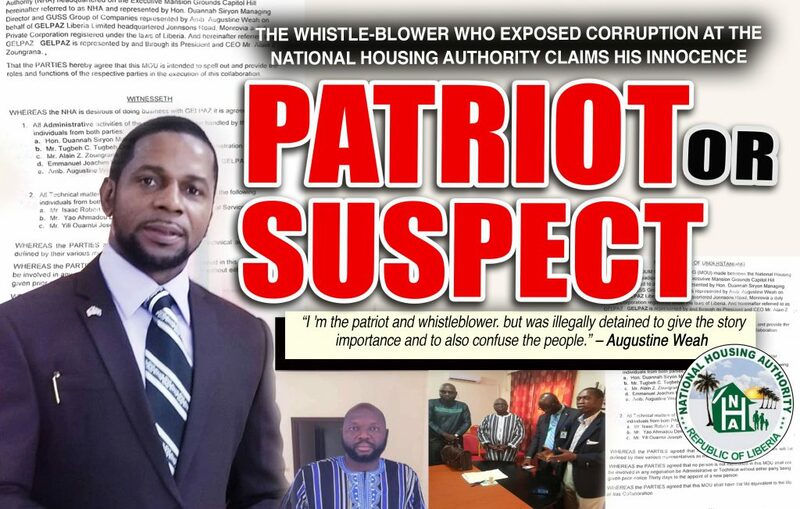 Weah, a representative of the Burkinabe company, GELPAZ Construction in Liberia, was one of three persons picked up last month after the Civil Law Court in Monrovia issued a Writ of Ne Exeat Republica on the Managing Director of the National Housing Authority (NHA), and his deputy for administration, Tugbeh C. Tugbeh for allegedly soliciting and paying of bribes, respectively. The chain of events was triggered when two of the key suspects – Siryon and Weah began recording on each other. Siryon, according to sources was looking to get Minister of State for Presidential Affairs, Nathaniel McGill on tape and when Weah noticed that he was recording, also started recording as well, detailing the breakdown of monies allegedly paid to several senior government officials. While both men apparently had their motives, Mr. Weah, insists it was his blowing of the whistle on the saga that led to the exposure of what was taking place at the NHA. “I ‘m the patriot and whistleblower. but was illegally detained to give the story importance and to also confuse the people,” he told FPA while decline to provide more details of the case which is currently in court. In May, Weah was contacted by the GELPAZ realtor company base in Burkina Faso. The company had expressed interests in building about 50,000 affordable homes for the poor and middle class in Liberia. Weah, according to some close friends and associates, saw the opening as an opportunity to help his country and people move forward. It was then that Weah contacted a friend who put him in contact with Mr. Siryon, who had only a couple of months earlier been appointed Managing Director of the NHA. After a few discussions, GELPAZ invited Siryon to Ouagadagou, the capitol of Burkina Faso to see some of the work they have been doing and to also give the new NHA boss a first-hand tour of their operations in Burkina Faso. Weah, reportedly took some time of his job at the UN in hope of using his ties to GELPAZ to bring the project to Liberia. Following the visit in May, Mr. Siryon invited the GELPAZ Realtors company to Liberia. The team arrived in Liberia in August and quickly signed a Memorandum of Understanding with the NHA. At a news conference after the signing, it was agreed that GELPAZ would build 50,000 homes. Weah, who writes and speaks fluent French came in handy as a key link between GELPAZ and the NHA. Thus, Weah was named as the company’s local representative in Liberia. Hopes were high for GELPAZ’s entry into Liberia with promise to create close to 5K jobs in the 15 counties. But first, Weah wanted to discuss with his family, who after consultations agreed that he take a year off from the UN to work with GELPAZ as country manager in Liberia. In addition, he was also appointed member of the leadership of the company as VP for Administration and second shareholder for the Liberia operation. But Siryon, realizing Weah’s strength and close ties to GELPAZ wanted more and began ignoring his own notarize contract, deciding to break all protocol and directly engage the company without Weah’s consent. It was then that Siryon is said to have begun making requests to GELPAZ about money. So, when GELPAZ’s President Alain Zougrana agreed to Siryon’s demand, without Weah’s knowledge, sources say, Zougrana sent his General Project Coordinator Mr. Emmanuel Tapsoba to Liberia to make delivery to Mr. Siryon the said amount. Weah, according to one source who was in proximity of the discussions, was called in to witness the transfer since he was the country manager. Weah, who was in Mali at the time, flew in to Monrovia to witness. While in Liberia Siryon contacted the Coordinator at his bedroom in the Royal Grand Hotel back in September. The Coordinator summoned Weah to his bedroom on the 3rd floor of the hotel to meet Siryon. The coordinator, the source explained, informed Siryon that the President of GELPAZ had sent him to make delivery of $US80K. It was then that Weah, as the local representative asked the coordinator, what was the purpose of the amount? Weah was reportedly told by the coordinator that he(the coordinator) was just the messenger instructed to deliver to Siryon as per the President of GELPAZ’s instructions. After the delivery, GELPAZ decided to return to Liberia to sign the formal contract in order for the work to commence. To their dismay, the delegation was in Monrovia for three weeks but Mr. Siryon reportedly refused to meet with them. The team followed up that visit with another one, in October, with Mr. Weah forming part of the delegation but once again, Mr. Siryon refuse to sign the contract. Feeling jittery, the GELPAZ team began wondering what was the holdup and why Siryon was reneging on sealing the deal despite all that they had done. A GELPAZ source speaking on condition of anonymity told FrontPageAfrica Monday that the suspended NHA boss was reportedly demanding $US500K in order to sign the contract but the company’s financial advisor reportedly said he did not have that amount. Siryon has denied demanding money from the company. When Weah was later informed by GELPAZ’s executives, he was reportedly angry. It now became clear to Weah, said one source why Siryon breached the protocol of the MOU in a bid to gain direct access to GELPAZ and make his demands. An upset Weah reportedly confronted Siryon, telling him he had no right reaching out directly to GELPAZ without his knowledge. To the dismay of GELPAZ, Siryon again refused to sign the agreement. After a two-week stay in Monrovia, GELPAZ was only able to sign a contract with the Liberia Bank for Development and Investment (LBDI), as the marketing partner for the homes for GELPAZ the company went back to Burkina Faso. In early November, Siryon made contact with GELPAZ to return to Monrovia. The company’s leadership contacted Weah to join them in Monrovia. To Weah’s surprise, one source explained, Mr. Siryon rented two vehicles and went to the airport to welcome the company’s CEO, perhaps thinking that his request of $500K was on hand. Mr. Siryon then reportedly directed the convoy from the airport to town. His Deputy for Technical Services, Isaac Robert at NHA who was visiting a friend at firestone saw he (Siryon) at the airport came and asked Siryon: “Are you now a flight attendant what you as MD doing at the airport on Sunday welcoming investor when they’ve the national representative in Liberia and VP for Administration for GELPAZ Liberia? Embarrassed and ashamed, Weah, Siryon was ashamed and got in his car and went away. Even after all of the noise, Mr. Siryon reportedly, was still asking for kickback from the company which lead to Mr. Weah, in his capacity of national representative getting angry. Mr. Siryon reportedly threatened to cancel the first MOU and other working document signed by NHA and the company. He also threatened to record their conversation to include his two deputies Tugbeh C. Tugbeh and Isaac Roberts Jr. and also Mr. Augustine Weah. One eyewitness told FrontPageAfrica Monday that Mr. Weah told Siryon, ‘if he did not allow the company to come and help build affordable homes for citizens, he has no other option but to make him know that Liberia doesn’t belongs to him as MD it for all and he made his sacrifice to come and help Liberia so Siryon shouldn’t stop the creation of more than 5,000 jobs. By this time, the level of distrust had escalated with Weah taking the extra steps of recording Siryon’s confessions. FPA recently published records from the Liberia National Police which established that on September 16, 2018, approximately 19:00 defendant Siryon, Managing Director of National Housing Authority went to a local hotel in an apparent move to receive money from GELPAZ’s coordinator Emmanuel Tapsoba. Defendant Weah, who purported as ambassador to GELPAZ, accompanied Tapsoba. The record says during the investigation, defendant Siryon was quizzed whether or not he did receive money from the coordinator of GELPAZ, how much was the amount he received, and for what purpose was the money given? He (Siryon) denied receiving any money at the local hotel on said date but admitted receiving US$1,000 from defendant Weah at the same hotel prior to the signing of the MOU between GELPAZ Company and NHA. Defendant Siryon told investigator that after he received the US$1000, he got down to the hotel lounge had a second thought and went back upstairs where he met and returned the same amount on grounds that it was illegal. On the audio recording where he is heard admitting in the presence of his two deputies and defendant Weah that he received US$80,000, Siryon maintained that he didn’t receive any money. Weah openly told the investigation in the presence of his lawyer that he was present at the hotel when GELPAZ coordinator Tapsoba gave the amount of US$80,000 to defendant Siryon an amount he (Siryon) requested to soften the ground. In furtherance of his assertion, NHA boss gave him (Weah) 20,000 to him to keep and present it to NHA boss, which he did the next day in the presence of some NHA staff. Police later interviewed the president of GELPAZ Mr. Alain Zoughan at another local hotel room 3014 where Zoughan admitted through his interpreter Dr. Mahamoud Ouadrago, to sending US$92,000 in two payments. According to Zoughan US$50,000 was given the coordinator in Burkina Faso on September 16, 2018, and US$ 42,000 was given to Benad Bazonon in Burkina Faso on September 23, 2018 to have same given to the GELPAZ coordinator for final presentation to Weah. When investigators spoke with Bazonon to find out if he received money from Zoughan, he admitted and explained that he delivered the said amount to his former coordinator as was instructed, that the money was given to Weah by GELPAZ coordinator Tapsoba in his (Bazonon) presence. For the immediate future, as the defendants – all out on bail await their fate, government prosecutors appear to still be struggling to finalize a date for hearing in a case now drawing immense interests after a series of damaging recordings from a whistleblower-turned suspect now in the fight for his professional life. For the foreseeable future, in the absence of a hearing date, many are wondering about the fate of the other names mentioned on the recordings – McGill, Finance Minister Tweah, Justice Minister Frank Musah Dean and others who have so far been omitted from the proceedings. The trio, according to a November 25th statement from the Ministry of Justice rejected any suggestions that Siryon or Weah acted on their behalf. With prosecution on the horizon, it remains to be seen how fast prosecutors will move to put the case on the docket.